In the first of a two-part feature, Academy player Lyndon James, tells trentbridge.co.uk how he hopes to forge a career in the county game - just like others at his former school have done so in the past. There’s been plenty of talent to graduate from Oakham School with cricketing honours – most famously Stuart Broad – and batting all-rounder Lyndon James is hoping to become the latest in that prestigious list to play in the first-class game. The Worksop-born Nottinghamshire Academy player has caught the eye at Trent Bridge this season with both bat and ball thanks to some mature performances that have belied his 18 years of age. 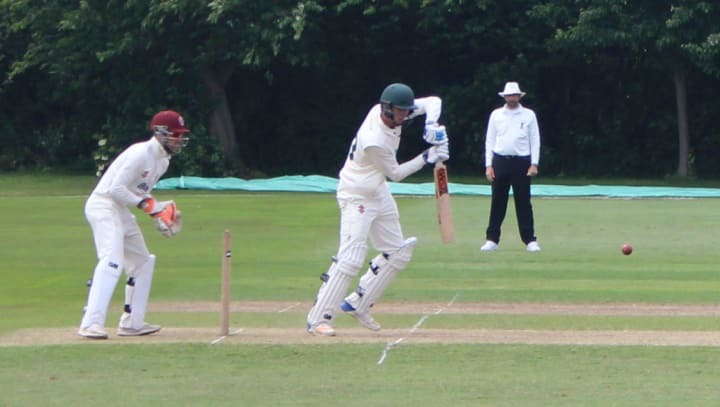 Already a regular for the Club’s Second XI, playing in all three matches against the MCC Young Cricketers this week, James hopes, one day, of appearing on the senior stage for his home county. Those ambitions have been further encouraged by the recent progress of a trio of players who have made the jump up from the seconds this season to acquit themselves well at first-team level – Matt Carter, Jack Blatherwick and Matt Milnes. “There’s been some good players come through at Oakham when you look at it,” point out James. “There’s Stuart Broad, obviously, but also Tom Fell, who I recently played against when he played for Worcestershire Seconds and Matt Boyce (as well as Josh Cobb and Alex Wyatt), who have all come through there. “It’s nice to have been to a school which has some kind of history in terms of producing players and it would be fantastic if I could be the next one to make it to that top level. “It was a great place to learn more about your cricket, I was always in and around it, and it gave me a good grounding thanks to some great coaches there including John Crawley, Frank Hayes and Neil Johnson. “Now I’m at Notts, the fact that people like Matt Milnes, Jack Blatherwick and Matt Carter have gone into the first team from the seconds does give me and all the rest of the lads encouragement. “The second two of those were playing a white ball game with the Academy and then a couple of weeks later they were playing in front of nearly 15,000 people for the first team at the Family Fun Day. Initially growing up in Retford before moving to Bottesford aged 10, James has played cricket for almost as long as he can remember. As is often the case, the family influence was key in him taking up the game – and continuing in it. James adds: “My half-brother James Keywood started playing around the time of the 2005 Ashes, and he was quite influential on me when I was younger. “Whenever he was playing, then I would play with him. He coached me a bit, as did my dad, who also played for a while, and I fell into it through that. James has been fortunate enough to have a number of coaches who have helped him progress his game to where it is now. The player, who is set to begin a degree in Politics at the University of Leeds in September, is thankful for all of that input. “Originally I was at Bridon, but I played most of my club cricket at Belvoir Castle and now I’m currently at Caythorpe,” he explains. “Former Notts batsman and current committee member) Darren Bicknell was at Belvoir for a while and he did a bit of coaching at my school as well as at the club, which was excellent for me. “Along with my brother, Gareth Jones and another coach at Bridon were the coaches who first taught me how to play, and they were great blokes. “My half-brother James played for Bourne quite a lot in the Lincolnshire Premier League, was at Belvoir with me for a bit and now plays on a Saturday in a Leicestershire League near where he lives, as he now works at Leicester Tigers. Read part two of the feature here. T20 returns to Trent Bridge on 4 July with a 2017 Finals Day rematch of Notts Outlaws v Birmingham Bears. Tickets are £10 in advance for adults, £7 for over-65s & under-21s and £5 for under 16s. Secure your seats now.